We have completed our comprehensive dyno test of two of Stillens hottest performance parts for the 370Z, their all stainless exhaust system and high flow cat combo combined with Technosquare’s tuned ECU. For this round of testing we used the Superflow AutoDyn 30 chassis dyno at Technosquare Inc.　As we have explained in previous tests, the AutoDyn 30 is a dyno that uses both inertial and static loading with weighted wheel rollers and an eddy current power absorber. This is a very different method of measuring power from the common Dynojet dyno which is purely an inertial dyno. The AutoDyn 30’s principal advantage over the Dynojet is that it can load the engine more than a Dynojet to give more accurate results and to give the engine and drivetrain loads more closely mimicking what they actually see when they are being driven. The eddy current power absorber makes also the AutoDyn 30 better for tuning. One major difference between the AutoDyn 30 and the Dynojet is that it gives lower, more conservative power results than the Dynojet, so don’t be surprised if you see bigger number for 370Zs parts from other people, magazines and companies, the important thing to see here is the difference in power from run to run on the same dyno, not from dyno to dyno. We strove for accuracy and repeatability in our testing. We did all of our testing during one day. We used standard SAE correction. We thoroughly warmed up the engine and the drivetrain by driving the car on the dyno at speed for about 10 minutes to warm the engine, transmission and differential oil (this car is equipped with Technosquare’s oil cooler kit) as well. We started every dyno pull at the same water temperature and allowed the car to normalize after every pull by letting it run on the rollers with no load after each pull with the dyno’s large fan running until the water temp stabilized. We monitored the air fuel ratio on every run to make sure that the tested part was affecting performance, not what the part did to the tune. The first part that we tested was the Technosquare ECU reflash. The Technosquare 370Z ECU reflash is a reprogramming of the engine control parameters of the factory ECU. Technosquare can program a 370Z ECU in the same manor that Nissan would do from the factory. You can simply send your factory ECU to Technosqaure and they can reprogram it with their performance enhancing program. A reflash is advantageous over things like piggyback computers because a piggyback fights the closed loop learning control of the stock computer. What happens is that with a piggyback device, the factory ECU often will undo the changes the piggyback makes. Technosquare changed the fuel, timing, cam control and rev limit maps to get there gains. Once again we asked Technosquare not to custom tune the ECU to the particular combination that the Killer Bee was running but to use their off the shelf ECU reflash to represent results similar to what a mail order customer might get. The most impressive part of the ECU flash is the extension of the factory rev limit from 7700 to 8000 rpm. The power continues to climb to 8000 rpm and adds a huge useable area to the power curve. The Technosquare ECU turned out to be a highly effective mod. 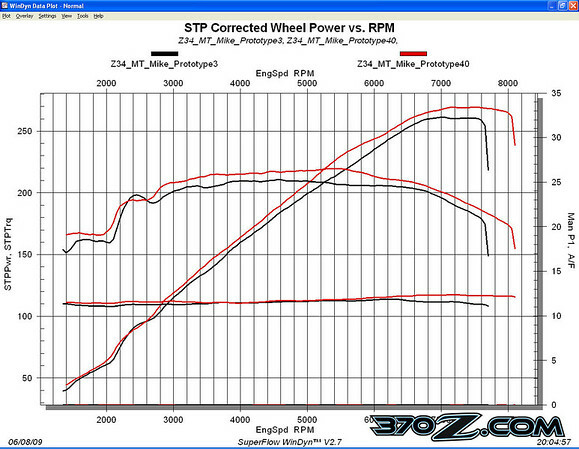 Our power increased by a healthy 10 hp to 272 whp at 7400 rpm and 220 lb/ft of torque at 5400 rpm. The torque curve is amazing, dwelling over 200 lb/ft from 2600 rpm to 7000 rpm. That’s more like a wall of torque instead of a curve! The engines power curve is extended to 8000 rpm and the power hardly falls past the power peak, at the 8000 rpm fuel cut, the engine is still putting out 265 whp. So far in our testing the Technosquare ECU has proven to be a pretty decent bang for the buck.